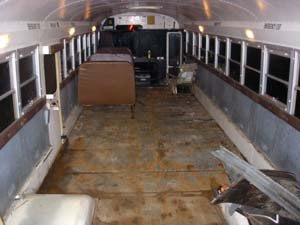 Bus Conversion Day 2 - Plywood Removal & More! Today was long. Even though I got rained out for part of the day I think overall it went well and was productive. 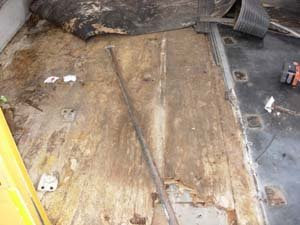 First thing that had to be done before the plywood could be removed was the removal of the rear heater. 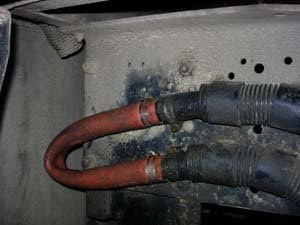 The heaters in these buses rely on the heated water/antifreeze from the engine. 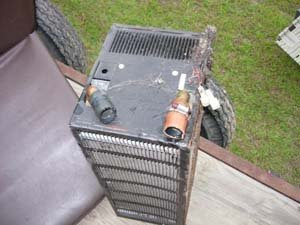 It is transported from the front all the way to the back through 2 hoses and attaches into the heater. One has water coming from the engine the other has water going to the engine. There is water/anti freeze in these lines. 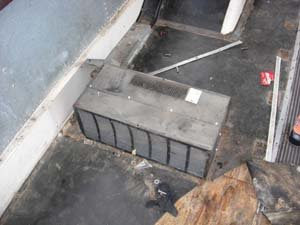 I detached the heater from the floor by removing a few screws and then moved the heater to the side emergency exit where I detached the hoses over a bucket to catch as much of the fluid as possible. After this I put the heater on the trailer. It's ready for the dump! The next part was a little tricky. 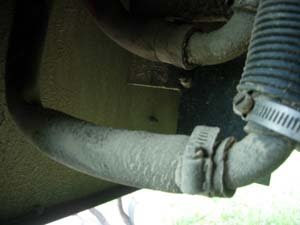 I had to follow the hose all the way into the engine compartment to figure out how I was going to cap it off. 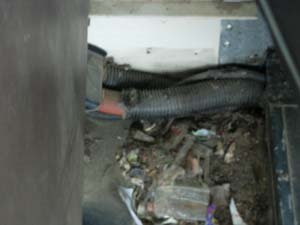 This is where the hose went from the inside of the bus down under it into the engine compartment. 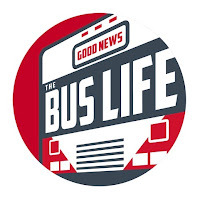 This is where it comes down under the bus. 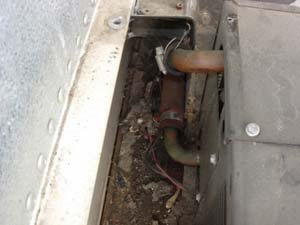 I am no expert but as far as I know there is no harm in just looping the fluid. 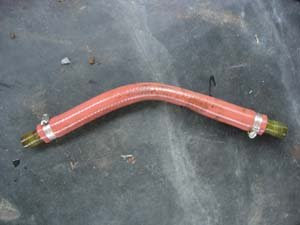 I took a piece of hose and made a loop. As I was sitting under the bus working on this it started to rain. So I was getting wet quick. Not only that but when I cut into one of the hoses I basically took a bath in anti freeze. We all know how good that stuff is for you. So this part was not to fun. After working on it some time it was done. The hose is a little kinked but that won't matter anyway because it is just a loop. 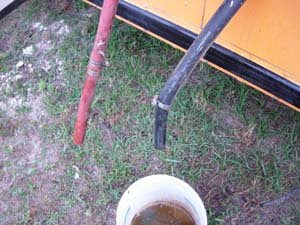 UPDATE: I later disconnected the two hoses at the front of the bus where they orginated. 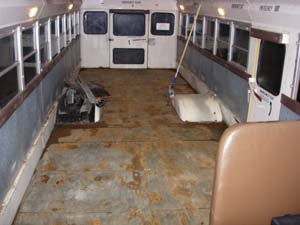 After the rain let up I decided to start on the plywood removal. 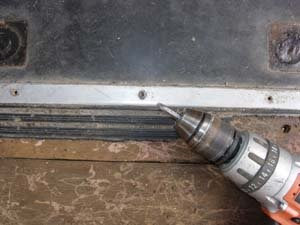 At first I planned on unscrewing all the stripping with my drill. 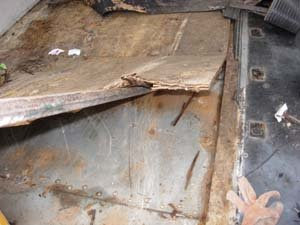 This didn't really work to well because old rusty screws just don't like to come up so I just decided to rip up the plywood and the stripping all at once. Probably the fastest way to do this is with a large pry bar. A really large pry bar. Give it a good shove under the wood and lift up and the screws give. Luckly there were not a ton of screws in this wood. I think the manufacturer relyed on the bolts from the seats to hold the wood down. After doing this for a few hours I was basically done and the plywood for the most part was all out and loaded on the trailer ready for the dump. What a day!